was established in 2001 by Eric Sutton, the owner, in his home garage. One day after a race going through the normal maintenance of preparing for the next ride, he came up with an idea of a pre-filter incorporated into an air box cover. He realized, after a some research, no one had a product like this available. He took the first steps to make his idea a reality by using parts laying around in the garage and invented the first airbox. It ended up working so well and being so unique he decided to introduce it to the market place, January of 2002. In the beginning it was more of a hobby, making all the aluminum plates by hand with routers, jigs and normal mechanics tools. Popularity quickly grew with the help of ebay and some internet forums. By the end of 2002 Eric realized their was a large enough demand and invested into CNC machining the parts. The year 2003 turned out to be an even better year with the great responses EHS Racing was receiving from all of its current customers. Eric then decided to send the newly designed YFZ 450 airbox cover to Dirt Wheels. A couple of months passed when the call from Dirt Wheels Magazine came delivering the news that YFZ cover would be featured in the 2004 May issue. Once the article was released it took EHS Racing from the hobby it was to a full time shop that it is today. 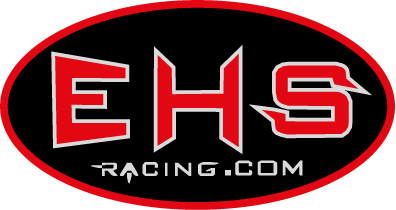 In the summer of 2005 EHS Racing relocated from the home garage in New York to its present location today in Rockingham, North Carolina. We currently manufacture all of our parts in house with state of the art CNC equipment. We also operate a full service quad and street bike shop our main focus is developing new products and trying to keep up with the demand of our existing ones. EHS Racing is still a smaller company that focuses on customers’ individual needs. As EHS Racing continues to grow, we will never lose that level of service and personal attention to our customers. If for some reason any one is unsatisfied in any way please let us know as we will correct it without question. EHS Racing is a company built on honesty and integrity by a rider for riders.